This Thursday night, millions of Americans will celebrate the New Year with close friends, good food, and champagne. People who otherwise never drink sparkling wine will indulge in the experience—often at their wallet’s expense—in order to wish “farewell” to 2015, and to offer a warm welcome to 2016. For many of us, however, our champagne toasts come with some fine print: an additional tax on our effervescent vinos. 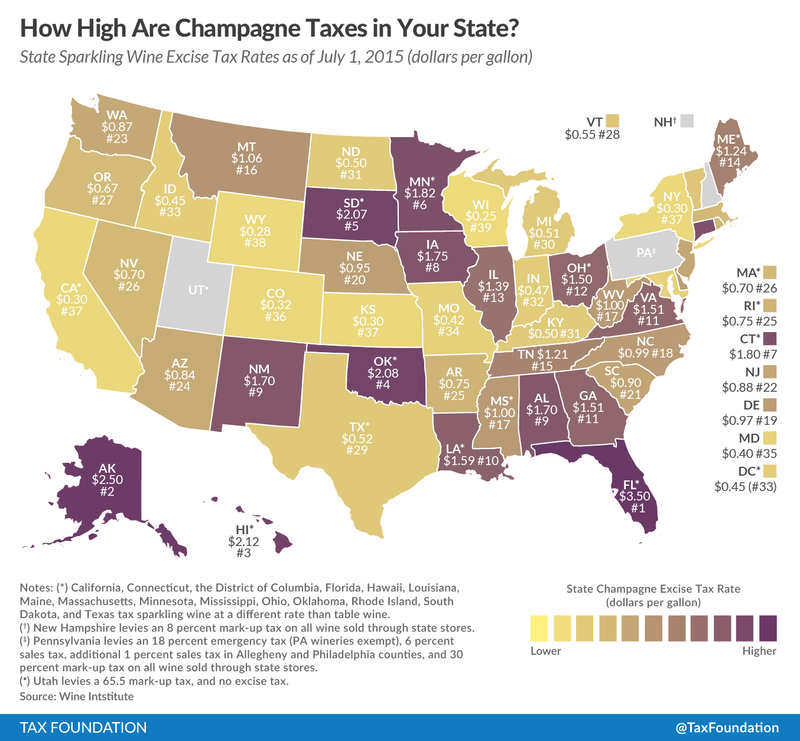 According to data from the Wine Institute, Florida comes in with the highest tax rate at $3.50 per gallon. This is a full dollar more than the second place holder, Alaska, at $2.50 per gallon, which is followed by Hawaii ($2.12/gallon) and Oklahoma ($2.08/gallon). On the other end of the spectrum, Wisconsin has the lowest of all the states with a rate of $0.25 per gallon, and is followed by Wyoming ($0.28/gallon). California, Kansas, and New York are close behind in 3rd place with rates of $0.30 per gallon. Also note, some states have alternative rates for wines in a specific alcohol content range. Don’t let the additional taxes on the last moments of 2015 spoil your evening, though. Eat, drink (responsibly), be merry, and have a happy New Year!